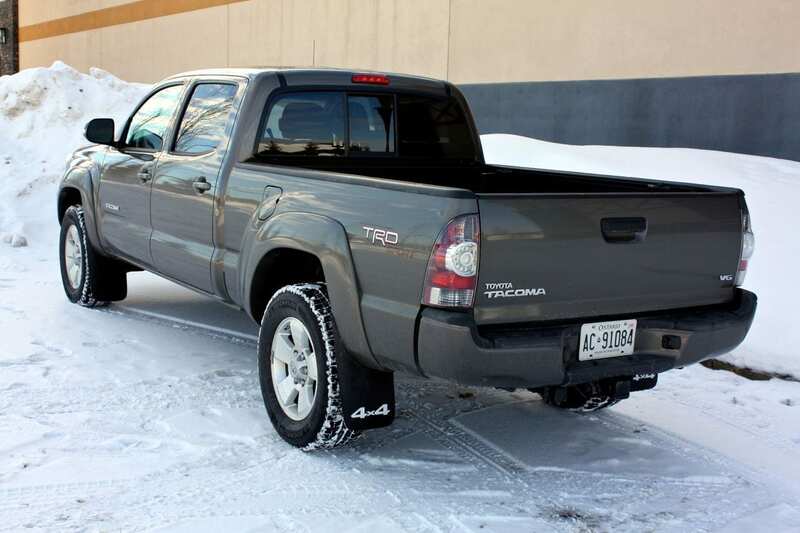 I’ve always been a fan of the Toyota Tacoma. In the end, much of what I know and remembered about the ones I drove in the past remains true, and many of the compromises of driving a true truck remain solidly stuck in place. 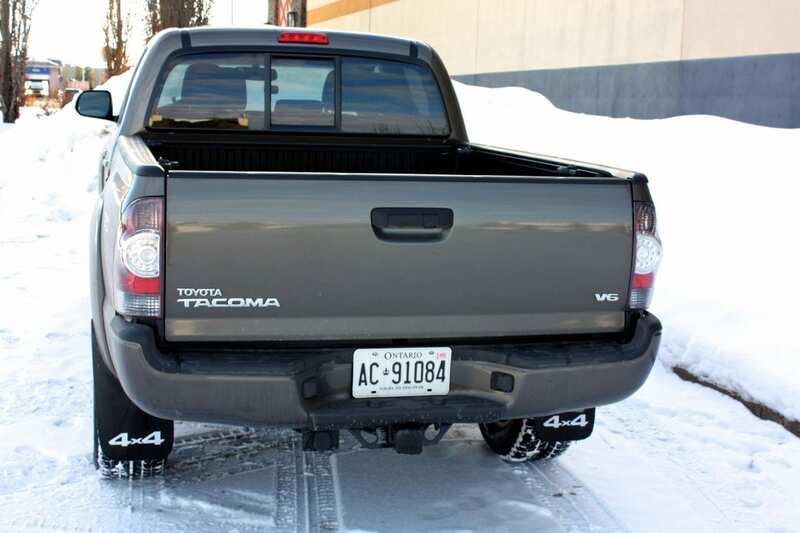 Maybe it turns out that I’ve been a fan of the idea of a Tacoma, rather than the ownership of one. But that’s my problem, and not yours. Nor the Tacoma’s. 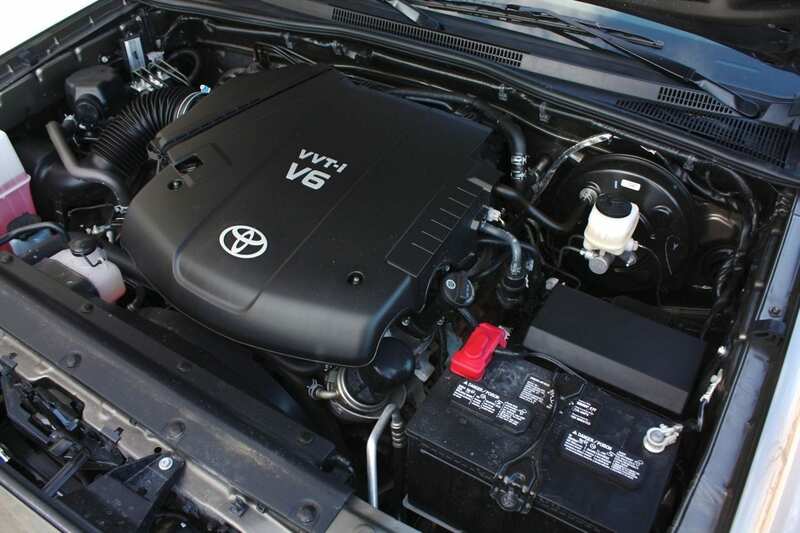 Here you’ll find Toyota’s venerable V6 – over the years, its displacement has crept up to 4.0 Liters. When you hear it, it’s got the same rushing, roaring sound under throttle that this engine’s ancestors made 20 years ago. Some things never change. The V6 makes 236 HP @ 5,200 rpm and more importantly, a fairly accessible 266 lb.ft @ 4,000 rpm. 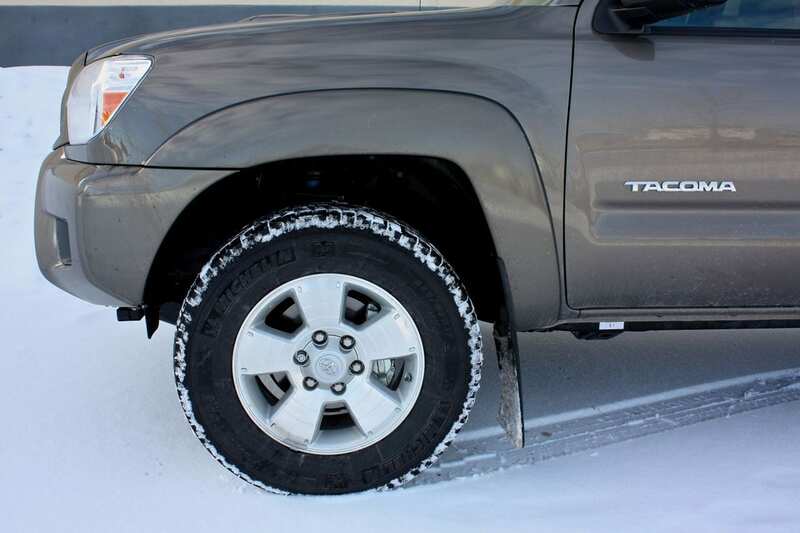 This Tacoma tips the scales at 4,275 pounds. Though this differs vastly from North American half-tons, it’s refreshing to drive a truck that doesn’t feel like it weighs a few tons. The power is fed through a 5-speed automatic, which didn’t impress nor offend. It just…. shifted. The Tacoma has an 80 Litre fuel tank, which is lovely, because it’s rated at 8.6 L/100 km on the highway and 12.9 L/100 km in the city. Gulp! That’s not me making that sound, it’s the Tacoma’s engine. I averaged roughly 19 L/100 km and I wasn’t driving with a heavy foot. Yikes. My truck, with the optional TRD Sport package had a 6500 lb. towing capacity – nothing to sneeze at for a light truck. 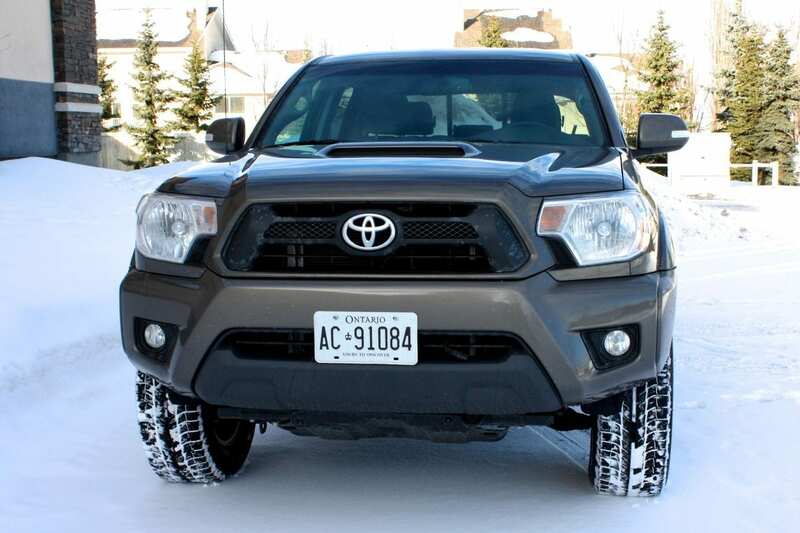 Toyota has continued to refine the Tacoma over the generations, but really, the look has remained relatively static. In my opinion, that’s a good thing. 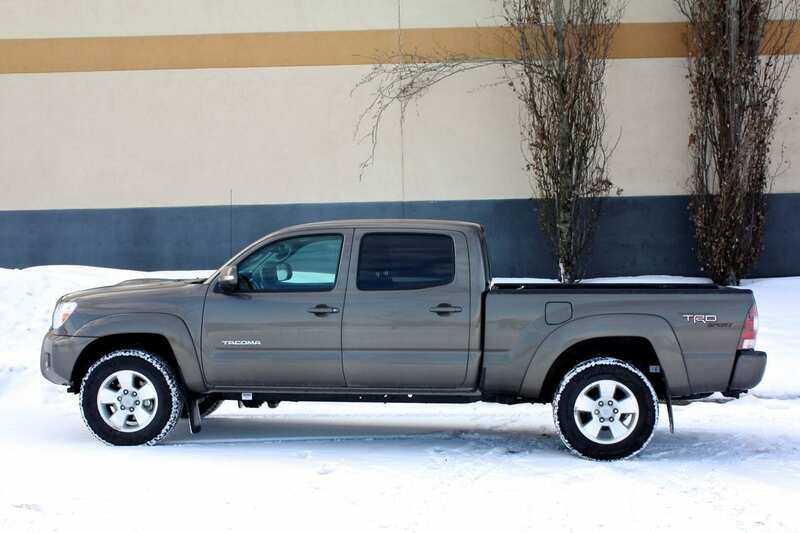 The Tacoma has a great mix of size, shape and utility. The 4-door looks a bit portly and slightly less handsome than the AccessCab. 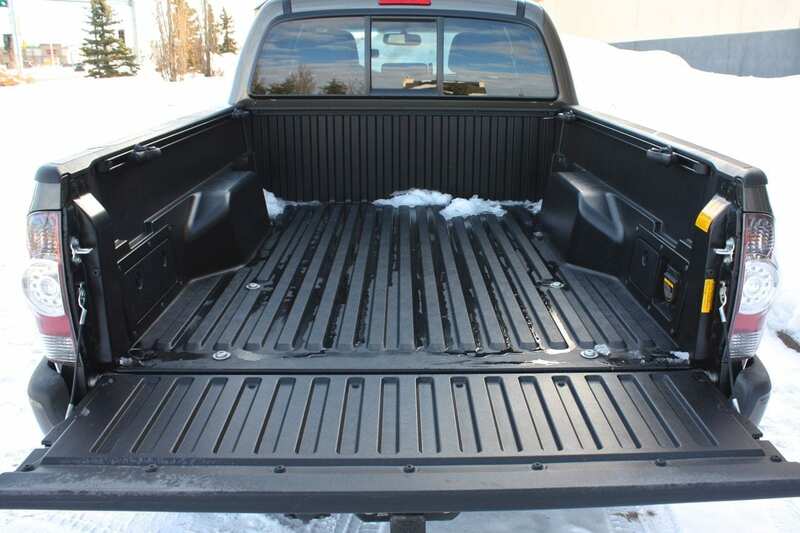 The Tacoma has muscular, flared-out lower door panels and fenders. 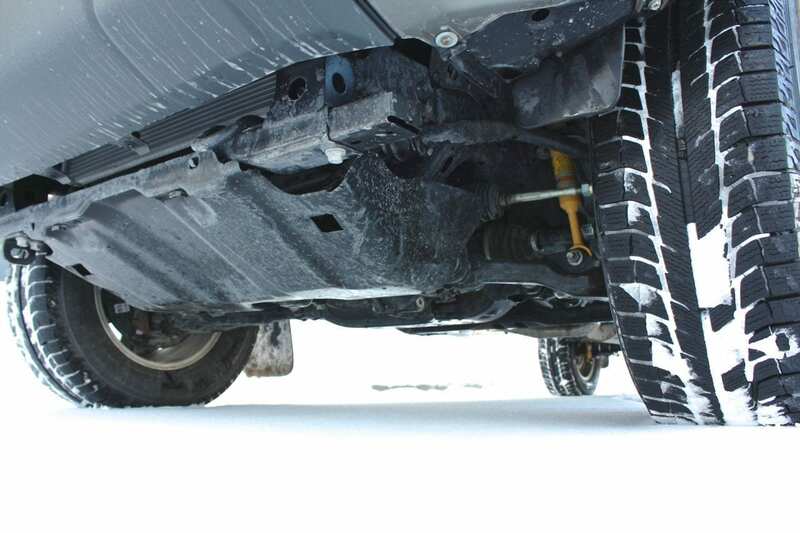 Ground clearance continues to be exemplary, and it defines this truck’s stance as well. There’s no missing the high step up into this truck. The ingress might be considered difficult for some, and frankly, painful for others. Hey, it’s part of having a truly capable off-roader. Inside I found excellent head and leg room for my 5’10” frame. You’re surrounded by almost exclusively hard plastics. 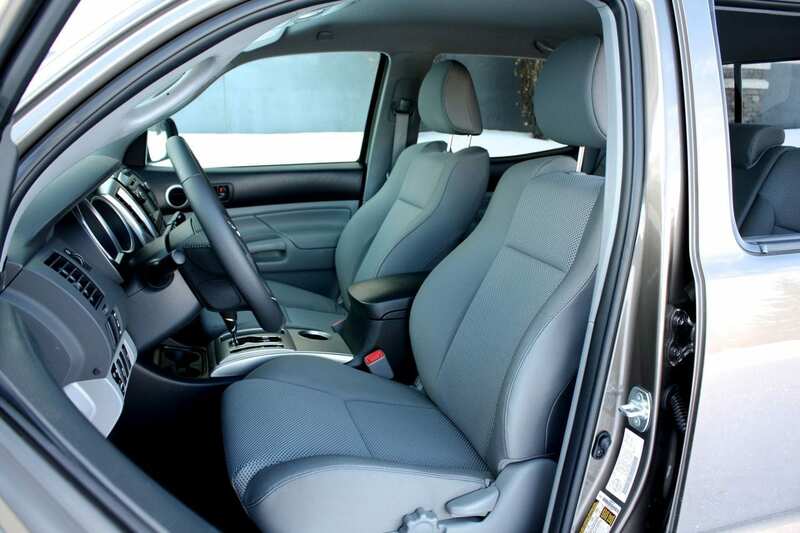 The heated, manually-adjustable seats are quite comfortable and offer surprisingly decent bolstering. With that said, the seating position is such that you’re practically in a La-Z-Boy, and you’ll find your feet straight out in front of you. It’s not for everyone. In front of you is a very short dash, and a couple of “Oh crap!” handles on the A-pillars. The steering wheel is manually adjustable for reach and height, and it was a good wheel to work with. It matters when you head off road. It has controls for the stereo and phone functions. 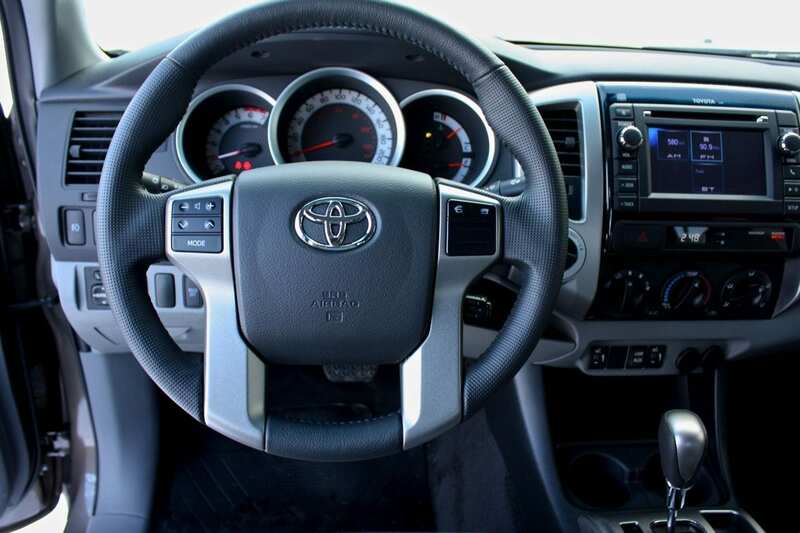 Behind the steering wheel sits a 3-gauge instrument cluster, with a small trip meter screen at the bottom. The center stack starts with a touchscreen head unit at the top. It’s pretty basic, handling audio and phone functions. The stereo sounds pretty good. Below that is an old-school “Hi, I was in Toyotas about 20 years ago” digital clock and underneath that, you’ll find a simple, manual climate control system. 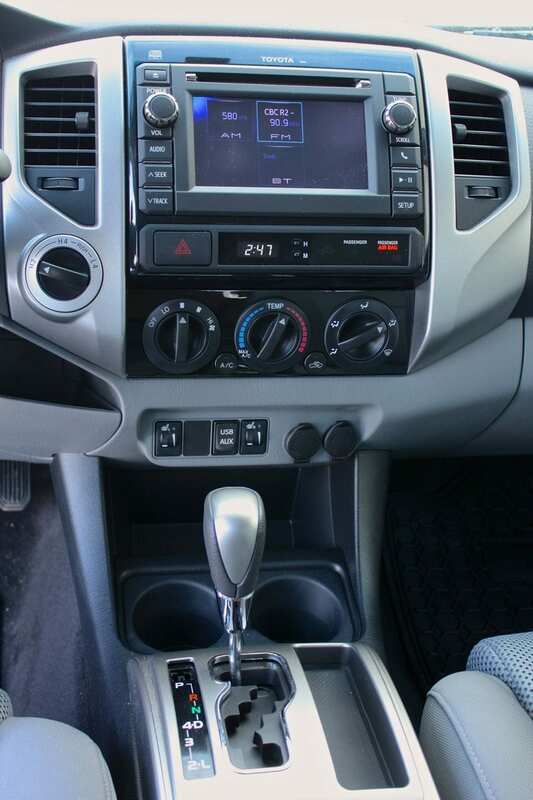 The console houses some open storage, cupholders, the gear selector and an armrest. The rear-view mirror displays some goodies, namely the outside temperature and a compass reading AND it has a small screen for the back-up camera with multi-hued distance markings. People complain bitterly about these, but in my opinion, I’d much rather have a little screen up there than none at all. You also get three HomeLink garage door opener buttons. There are two 12V plugs and an auxiliary/USB plug on the center stack. Getting into the rear seats is fine, other than the step up. Here you’ll find 3 seats, 3 seatbelts and 3 headrests. The 2 outboard seats are comfortable and I found the headroom and leg room to be reasonable. What else do you get back there? 2 cupholders at the back of the center console. And a sliding center window. The rear headrests, which can impede the rearward vision, fold down out of the way, and the seat bottoms can flip forward out of the way. 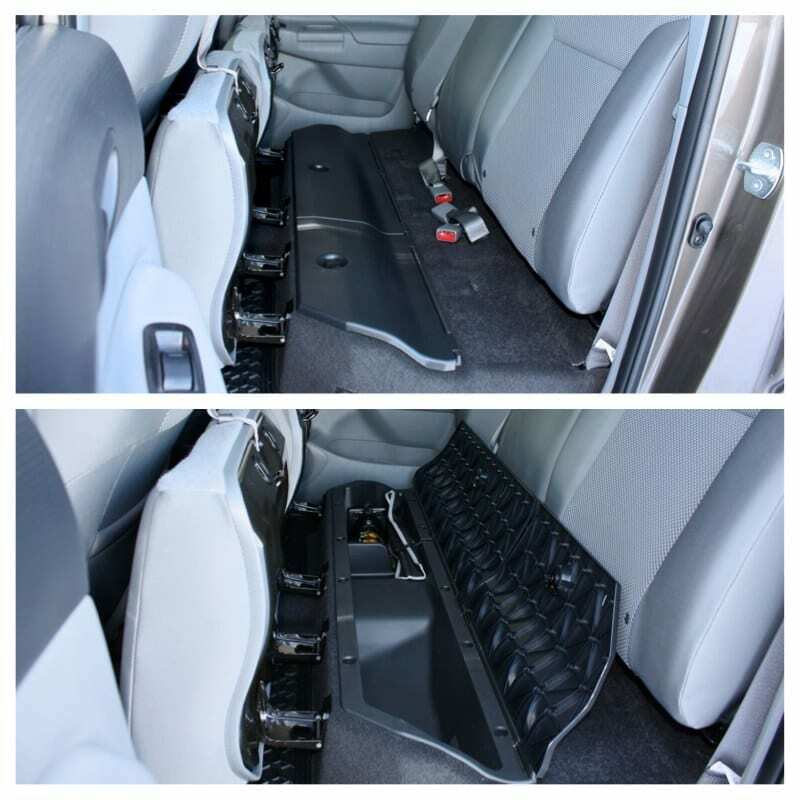 Under the seat bottoms are small but useful lidded storage bins. Our three kids fit back there like a charm, with space to spare and you’ll find 2 sets of LATCH anchors for their seats. 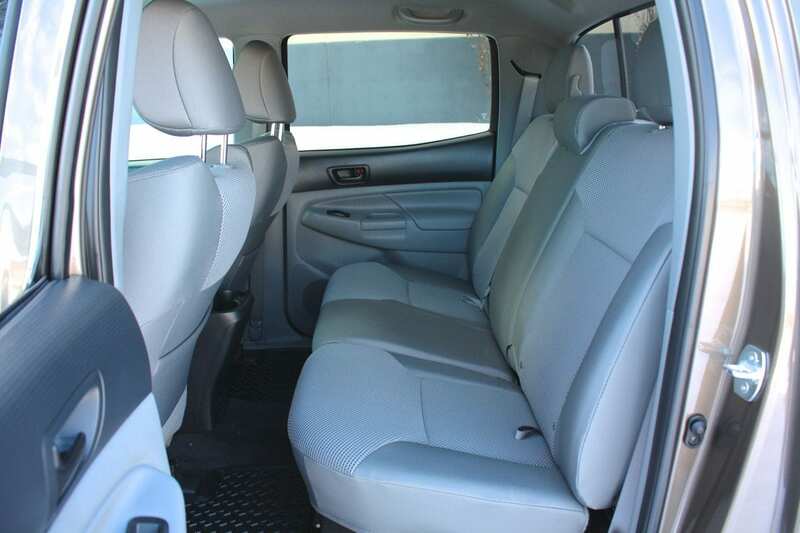 Toyota did a great job in using all the nooks and crannies to maximize storage space around the cabin. You get little bins and trays all over the place, including a deep, carpeted one under the armrest. If you run out of space around the cabin, there’s this thing called a box that sits right behind the cabin. Toyota has added a couple of small, lidded (but not lockable) bins on the sides of the box for small items. You get 4 heavy-duty stationary tie-downs, and for great flexibility, there are rails along the sides and the front of the box, allowing you to position further tie-down points anywhere you want. That V-6 rewards you with some goodness, and that is plenty of low-end and mid-range torque. I never found myself wanting for more jam in everyday driving. That torque likely bodes well for off-roading as well as towing, although I tested neither of those facets. The ride is exactly what you might expect from an off-road worthy truck. It’s firm, and a bit bouncy and it will soak up any road imperfections with ease. Speed bump? I didn’t notice any speed bump. Of course, if you encounter any kind of crack, or pothole, or other kind of Canadian road enhancement device, the truck will shudder and buck over it, and remind you that it can flex with the best of them. 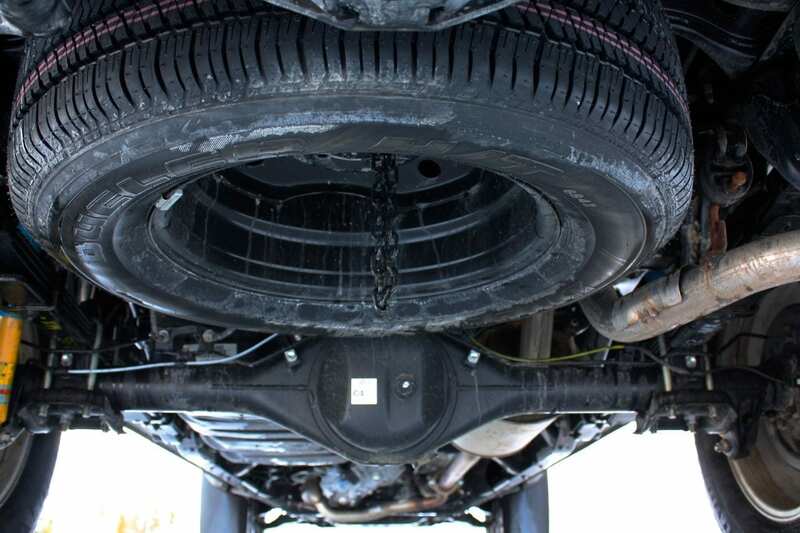 This isn’t a knock – every other truck does it, and until we figure out how to get rid of leaf-spring suspensions that essentially date back over 100 years, nothing will change. The handling is very competent. 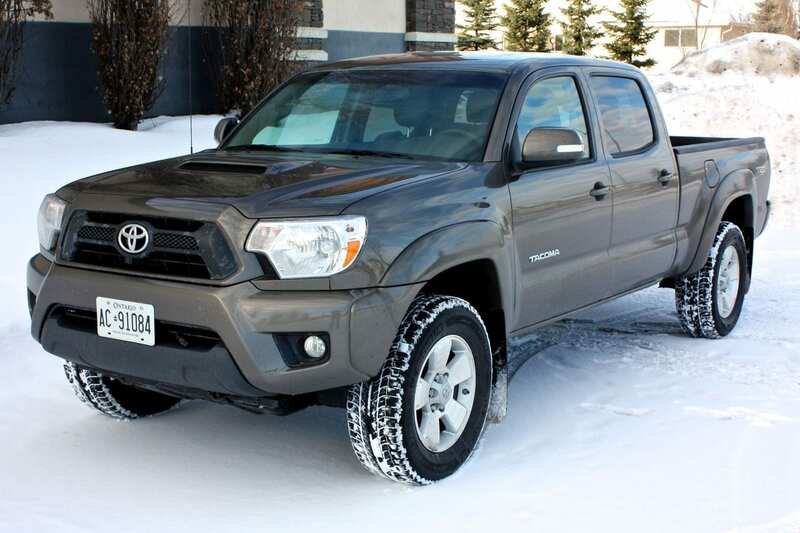 The Tacoma is a confident performer in city driving, and corners are handled with ease. The steering is well-weighted requiring very low effort – just don’t expect a tight turning circle. The brakes are very effective and powerful. Outward visibility is good, especially for the front and sides. Being a truck, you expect some wind and road noise, but all in all, it was acceptable. Once on the highway, the wind noise became quite intrusive. Although I did not have the opportunity to test its off-road capabilities, the Tacoma has a reputation for being bomb-proof and able to take a lot of abuse. 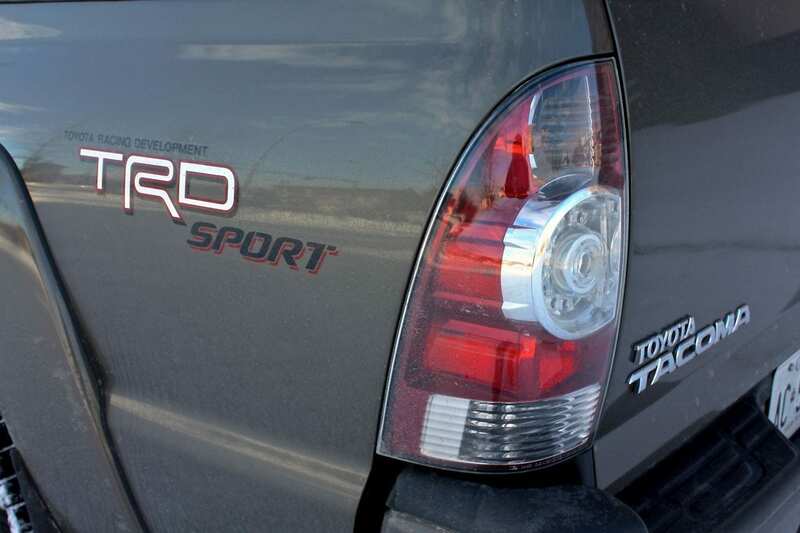 The TRD Sport package includes a ton of things, not all related to off-roading. You obviously have the ground clearance that’s required. There’s a massive front skid-plate. 4×4 modes are accessed with a rotary knob, allowing for on-the-fly 2-wheel drive and high or low range 4-wheel drive modes. There’s also an RSCA switch, which will deactivate the curtain shield airbags, in case of a vehicle roll-over. Wow. The Tacoma comes with a key. No, not like the old-school key with remote lock/unlock buttons on it. I mean, the OLDER-school with nothing on it. And a keychain FOB with the remote door lock buttons. Like hanging on an actual keyring. Luckily, if you lose it, you should be able to replace this in any local antique store. In terms of exterior conveniences, this Tacoma had a tow package with a hitch receiver and a 7-pin plug, and a 120V plug in the box. 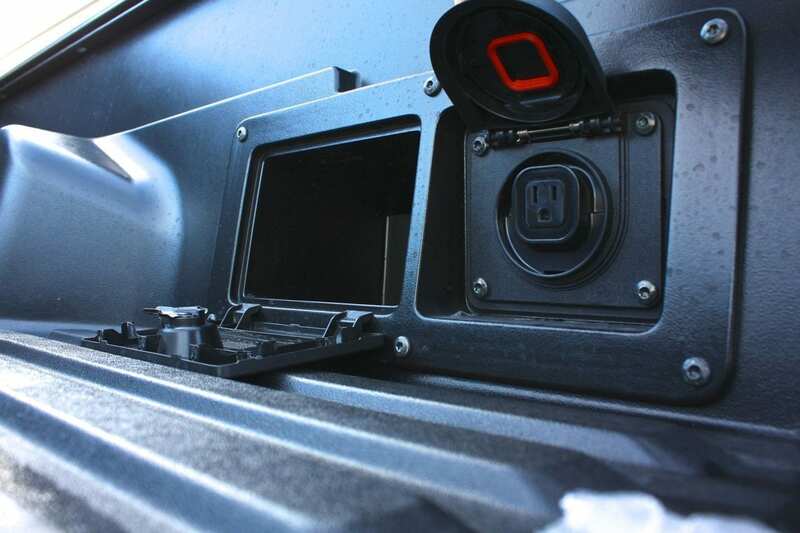 It seals with a spring-loaded lid, and can be switched from 100W to 400W inside the truck. In terms of a light truck, the Tacoma is a good vehicle. The ride is decent, it handles well, it’s a good city vehicle, and a very capable off-roader. It kind of reminds me of middle-school wrestlers. They looked moderately tough, but there was a surprising amount of substance behind their swagger. The Tacoma has a lot of substance. But the substance doesn’t obliterate the compromises. 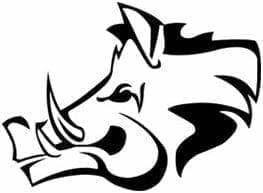 These compromises really won’t surprise anyone who is specifically looking at trucks, and typically you don’t find buyers, who were looking for a nice, normal car or utility vehicle, and ended up buying a truck. People who want trucks, buy trucks – people who don’t, don’t. The high step-in height, the truckish ride, the terrifying mileage – these are all trade-offs that most are quite willing to accept in exchange for the ability to clamber up rocks, down hills, over dirt, snow and anything else you might want to throw at this truck, and also being able to tow something down the road. 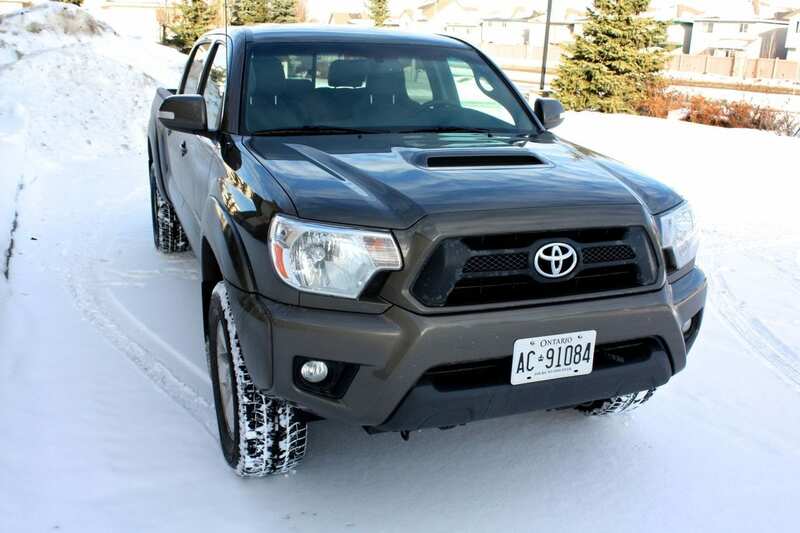 The Tacoma is well put-together, well-designed and well backed-up. In terms of an everyday vehicle, for folks who don’t need a truck, this would be a strange choice, but I don’t want to patronize this storied 4×4 with a pedestrian rating when nobody would buy this to simply commute with. Or nobody should be buying it for that anyway. WAF (Wife Acceptance Factor) was very low. She didn’t particularly like the ride, nor how high the step-in height was. She did, however, enjoy the lit vanity mirrors. Women. This particular truck does away with the niceties and luxuries, and strips things down to what Toyota deems to be the essentials. Is it a great value? I don’t think so. It’s pretty darn expensive. But when you consider reliability and the astronomical resale value for Tacos, maybe it’s not the worst value, is it?